One thing that Ann Brauer knows is color, in all it’s glory! She knows the ins and outs of color. it’s properties, the shades, and hues. She knows the exact colors she will use in any one of her quilts. How does she know the perfect combination of colors? Ones which when arranged side by side, are better together, than individually? Did she learn that somewhere? I think she just knows, it’s an inner color sense. In any case,I know what I like and I like her work, it’s stunning. Am I a fan of Ann Brauer? You betcha I’m a fan, If you’re unfamiliar with her work, which I find to hard to believe, after one look I think you’ll become an Ann Brauer fan too. I know you will enjoy this reblog of an interview I did with her several years ago. Enjoy the master of color and design, Ann Brauer. 1-You’re obviously a creative person, what led to your choice of fiber as the creative medium for your art? That one is very simple although a bit of a story. I grew up around fiber–specifically the quilts that my grandmother made. Although I never thought I could make a quilt, I loved to work with different fabrics and in fact probably drove my mother crazy having her drive me to all the fabric stores within sixty miles of our home so I could look at the different fabrics available. I was very lucky because in the adjacent town, there was a store where the owner would go into New York once a year and purchase cutaways and remnants from famous designers. I did lots of sewing–made my ow n dresses, costumes for the high school musical, etc but never a quilt. Eventually I quit sewing because I was not wearing any of the tailored clothes that I enjoyed making. By training I am actually a lawyer. As a lawyer Ihadmy own company that did research for other lawyers. I would drive everyone crazy because I had to write out the arguments by hand and cut and paste them before I could figure out how to win cases. At one point I had a roommate who made quilts. I realized if I made quilts I could buy fabric. I loved the patterns created when I pieced even simple patterns together. Soon I ran out friends to give the quilts to and began selling them.Shortly thereafter I decided to move from Boston where I had been living to western Massachusetts and see if I could support myself as a quilt maker. The rest is history. 2-What keeps you inspired and motivated? I love working with the different fabrics and colors. Each quilt that I make inspires me to make another one. Usually I have far more designs in my mind than I have time to make them. I am inspired by nature and the emotions that nature causes me. For instance in this piece–endless fields–I was inspired to create the feeling of the prairies where the land seems to go on forever. 3–Who or what has had the most influence on your work? My grandmother is the most obvious influence. She was quite the character–spunky and opinionated. She made a quilt for me when I was born which had pieces the size of a postage stamp. It was and still is a wonderful quilt made with so much love and care. For her quilts were her chance to express herself as a person and show her worth in what must have been a difficult life. She not only made quilts for the beds in the house–some for warmth and some for show–but she also made a quilt for the closet of the guest bedroom. This quilt was too special to ever be used but I am sure that she brought it out for every guest to see. The stitches are so tiny and even–after she took her work to the local quilting bee, she would come home and take out their stitches . There are a lot of quilters whose work I admire and marvel at–Tim Harding, Michael James, Judith Larzelere, Jeanne Williamson, Regina Benson, Erin Wilson, Wen Redmond. I also look at other works in fiber on a regular basis including the embroidery of Natalia Margulis, the rugs of Meg Little, the baskets of Kari Lorning and Joanne Russo, the felt of Rene Harris. The collage of Laura Breitman to name a few. 5- Has the recognition and acclaim effected you as an artist? OK–I will be honest. I love recognition. I want more. Recognition spurs me on to further push myself to create the best possible quilts. And yet I do not work just to get recognition. When I try to make a piece just to get noticed usually the quilt does not work. When the quilt just happens then often I have a stronger piece. For instance rainbows of summer is a quilt that occurred to me. The colors seemed to just happen. I knew from the start that it was a winner and sure enough it was selected as a Niche fina list. 6-What has been your proudest accomplishment to date? Oh there are so many of them. 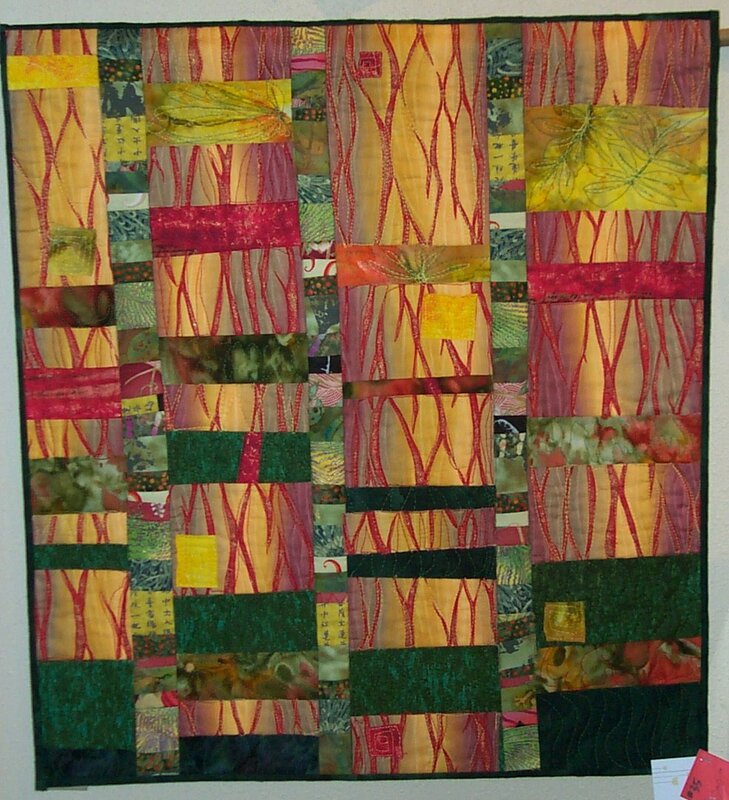 I would say my proudest accomplishment is that I have supported myself making art quilts for nearly thirty years!!! Not many can state that. In terms of specific pieces I would of course go for the series of quilts I made for the Federal District Courthouse in Springfield, MA–the quilts I made for the Lodge at Turning Stone in Verona, NY–winning an Award of Excellence at the Baltimore Craft Show. 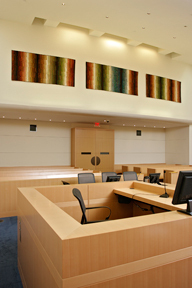 I love seeing my work in place and knowing that the quiltis indeed right. 7- What do you do for fun? 8- What advise would you give an aspiring quilter who is just starting out? There is so much advise I would give. Probably the most important would be to master a technique or a style. I was very lucky when I began because I would get orders for six small quilts in the same design and specific colors every month. By learning the effect of colors and fabrics on one particular design I learned a mastery of the commercial fabrics that I use. With this mastery came the ability to make the changes that made the work my own. I would also suggest learning to listen to the reactions of others to your work. I know that sitting in my booth at the craft fair I can learn when my work is communicating what I hope for and when I need to work on it. There is something very powerful created by working in series. This allows each quilt to guide the selection for the next quilt and helps you define your own style. These are several quilts that I have made in the same series. 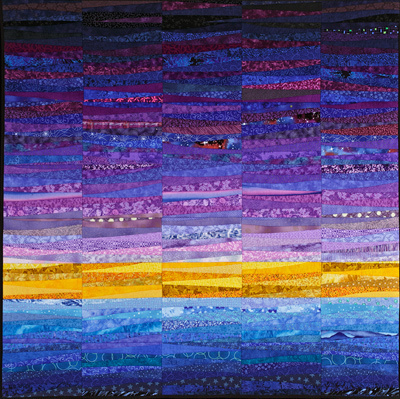 9-How would you describe your quilting style? My method is very simple–it is a quilt as you go process. I am trying to create work that captures the essence of fabric art but also transcends the medium. 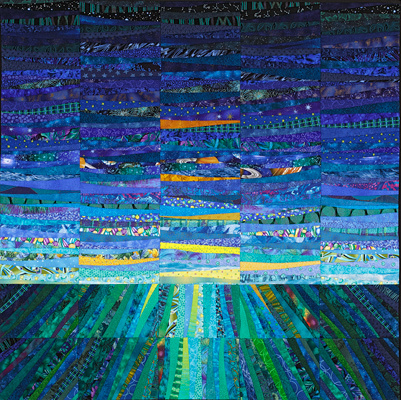 My quilts are contemporary abstract landscapes that rely on color, commercially available fabric and the traditions of quilt making to create vistas of my imagination. The power of the quilt comes from the combinations of fabric that I use and the care I take in designing very simple concepts that are instantly accessible and then gain added meaning the more when looks at the quilt. 10-Describe yourself in 5 words. Smart, focused, determined, sincere, kind. 11-What have been the biggest obstacles in achieving your success? The biggest obstacle–the need to earn money–has also been my blessing. By always having to stay focused on creating work that will sell while also knowing that I needed to justify internally the decision to leave being a lawyer to become a quilt maker, I had the freedom and determination to push myself to make the best quilts possible while also realizing that if I did not l like the quilts I was making, I could support myself doing something else. Outstanding tory there. What occurred after? 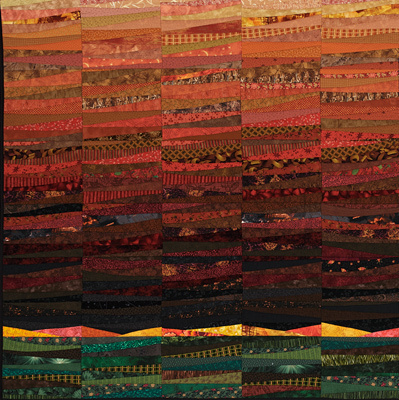 Reblogged this on Barbara Harms Fiber Art. I have known Ann for several years and her textile artwork really is very recognizeable wherever it is shown. She does an excellent job at communicating her vision.